This handmade picture frame has all the classic features of a Plein Air profile. A flat face creates clean lines and a rounded outer edge & inner lip adds just the right amount of distinctive detail. 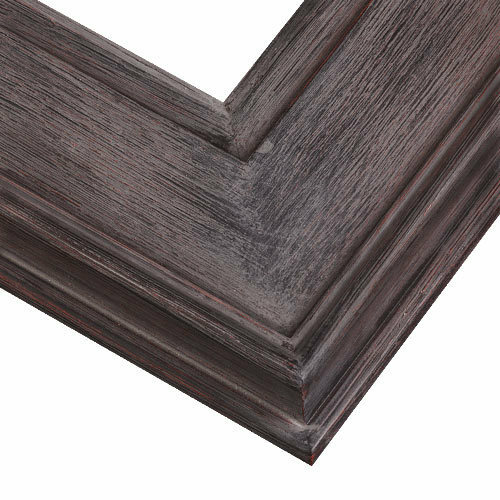 Plus, a beautifully weathered barnwood finish makes this genuine wood frame both simple and bold. The following sizes of this frame are ON BACKORDER until approximately 6/3: 9 x 12 and 24 x 36. Orders will be placed on hold until we get more inventory. Apologies for this delay. 5" x 7"6" x 8"8" x 8"8" x 10"9" x 12"11" x 14"12" x 12"12" x 16"14" x 18"16" x 20"18" x 24"20" x 24"24" x 30"24" x 36"
2.Complete My Frame With an Acrylic Front & Foamcore Backing. Gray is a nice departure from "old standby" espresso/gold. Beautiful, high quality frame as pictured. Professional shipping. I ordered this frame (actually two frames) for two paintings I was working on. When I finished the paintings I realized the color of the frames was not correct for these paintings. So no harm done. I now have incentive to paint two more pictures to work better with these beautiful frames. Very nice frame. Well made and nice design. Perfect for my oil painting. Fast shipping and well protected. This rustic gray barnwood frame compliments my small, rustic boat seascape oil painting perfectly. I plan to use these wood frames again on future paintings. Have used it before and was very happy with it! Have always had good luck with your products! I have ordered it before and I really like it! It looks rustic with clean line which is easy to match with any kinds of painting. classy and the 18x24 Mario puzzle for 10 yr old's room is perfect. I ordered this style of frame often, but this is the first one in driftwood, which I think will work great with the pastel painting I'm working on. I need to have a big rabbet space and this frame has that. Good quality for the price as well. Always packed well for shipping. Gray is popular and doesn't take away/clash with the colors in the paintings. My corner sample looks so good that I decided to order a 16x20 (because of the relatively wider moulding). The rustic finish should complement a landscape I'm working on now. Excellent choice of colors sizes and designs, I also like their website, very professional and they also offer PayPal. 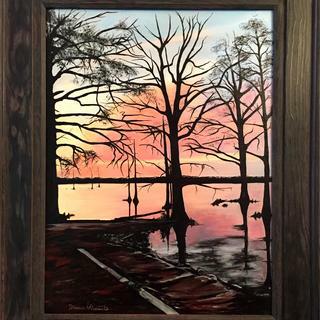 I chose this from among many rustic wood frames because it looked great with the bass fish oil painting it is meant for. The color and detailing put it a cut above the rest. I am an artist and came to shop for 2 recent paintings. The sale was really good so I decided to buy several frames in different finishes to have on hand for future shows. You never know what color frame will bring out elements of your work. This frame helps round out my 16 x 20 frame selection! It's beautiful and perfect with the art I will be adding to it. cheaper than going to local framer and perfect for my paintings. I ordered a sample and it looked beautiful with my pastel painting. I like the varigated natural wood with hits of purple in the gray. Selected to compliment the subject matter and color pallet of the painting. I love the subtle, weathered look of these frames. They're a nice break from the gold, silver, and black plein air frames. They have a simple profile which makes them ideal for the subject matter I paint. Beautiful--real wood frames. I've ordered these several times in the past and have always been happy with them. Simple variation from the usual gold, Silver and Black Plein-Air Frames. thought I would try it. I recently ordered a corner sample of this frame because of it's rustic look (a departure from the typical classic: Espresso/Gold) and decided to order a 16x20 because of the wider moulding. I'm sending another as a gift to a friend. We both do a lot of landscapes and this frame should dress up a pastoral scene rather well. my canvas is 24 X 30 X 3/4 inch - will my painting fit into this frame? BEST ANSWER: Yes, your canvas would fit this frame. I would recommend some canvas clips to secure it in the frame. Since the frame is only 3/8ths inch deep the canvas will be a little deeper than the frame but the width of the frame is wide enough to hide this effect. Yes - purchase the standard 24 x 30 inch frame and it should fit perfectly. Sure it will fit as long as your canvas size is accurate. Do you have a frame like this but isn't as wide? I would prefer one that is about half this width. BEST ANSWER: Unfortunately, we do not have this frame in a more narrow profile. However, we do have the Rustic Americana Collection. This collections has a 2" wide profile with a rustic overlay as a finish.